Sometimes you feel like a novel is tailor written to your interests and that's how I felt about Reconstructing Amelia. After years of avoiding crime fiction, this year I'm discovering that it's a rich genre for my interests right now. 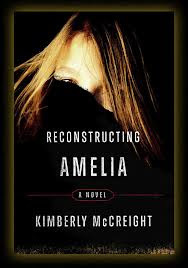 The two best new books I've read this year fall into this category and Reconstructing Amelia is one of them. Of course it seems like everyone is quick to rush to "the next Gone Girl" proclamation, and I saw that in EW's review of this book. It's not really anything like Gone Girl, though, except maybe by having two POVs. So...don't go in expecting that. But let me back up a bit. When I said this seemed tailor written to my interests, I meant it! First of all it's well written--the prose is engaging as soon as I started I didn't want to stop, I was hooked in. It's about identity and relationships, especially relationships between women--how complex they are, how friendships can be both good and bad at the same exact time, about mothers and daughters. It's about the identity we show the world and the people we love and also about who we really are and the courage it takes to embrace that. I loved it. I loved both Amelia and Kate and felt for them. So this is set at a prep school and there's even a sort of "Gossip Girl" and secret clubs and everything. Kate finds out her daughter has jumped from the roof of the school and is set to simply grieve this reality until it's suggested to her that maybe Amelia didn't jump at all. The book takes turns between Amelia's first person POV in the days leading up to her death and Kate's grappling with the mystery afterwards--reconstructing her daughter's last days in order to understand who she really was and what happened. I'm not going to lie...I did predict a few twists before they happened. But I didn't mind at all since that wasn't the point of the story to me at all. It was taking the journey with these characters. I loved this book and I'm glad I read it. It was also my April pick for Bloggers Recommend! This book is being promoted as a crossover with YA audiences, which is great--it should be. It's also for anyone who loves great mysteries, mother/daughter relationships, and good books.